Suddenly an angel appeared in the sky. The above is a translation of the first verse of first Khmer Christmas song I learned (you can listen to it here). We sung this song for the first time last Sunday, and it is meaningful to me because it represents my journey of celebrating Christmas in Cambodia. Christmas 2016 was a little better. We had gotten our feet under us by that point. We got a tree and some ornaments. Decorations went up early enough to enjoy them. Lauren and I got each other presents. We made it to the Christmas service. My parents were here visiting. There were so many more of those elements that I have come to expect from Christmas. If 2015 was about surviving Christmas, and if 2016 was about making our own Christmas traditions, then 2017 has been about starting to understand what it means to embrace the Cambodian way of doing Christmas. We are talking to more Khmer Christians about their Christmas traditions, being grateful for those who celebrate with family in their hometown and praying for those who are the only believer in their family. We enjoyed watching our own church plan a mini-Christmas pageant (I graciously declined the role of the angel). And of course, we learned our first Khmer Christmas song. We are also discussing with our partners how to participate in their annual Christmas Trip. The Christmas Trip seeks to provide a Christmas worship service to as many of the Baptist churches around Cambodia as possible. 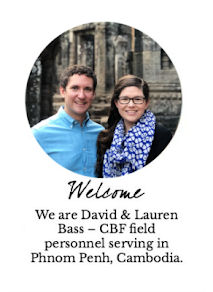 If there is some way in which we can come alongside the leadership of the CBU as they implement this program, it could be a great opportunity to support Cambodian Baptist pastors. Of course, we still keep as many of our familiar Christmas traditions as possible. The smell of cider and the sound of our favorite Christmas songs flow throughout our house. We will get to visit with family again this year. And even though evergreens aren’t exactly native to the tropics, we will still proudly display our little Christmas tree. But as our new song reminds us, we are now set to embrace more than before the reality that we celebrate Christmas in Cambodia now. And there is much to learn from the Cambodian way of doing Christmas. This Christmas night is a holy Christmas indeed, no matter where we find ourselves living when it comes around. From our family to yours, we wish you a very merry Christmas. And we hope that you too would find new ways to stay true to the best Christmas family traditions while also being open to the ways that the kingdom and mission of Jesus could change the way you celebrate his birth.